Doing one’s best–sounds like an easy enough concept. “Just do your best, that will be fine,” we are told by teachers and parents. But we quickly discover that doing one’s personal best is not enough. If you were like me, you found out at an early age that simply doing YOUR best wasn’t fine. At least it wasn’t fine if there was someone else who’s best was better than yours. If someone else could say their alphabet or color inside the lines or sing a melody or hit a ball better, then suddenly it became a matter of your being able to do not YOUR best, but THEIR best. For many of us, an activity that had been great fun up until then–singing, playing ball, reading–suddenly became an opportunity for us to be “not as good as”. Unless, of course, you were the one who’s best set the standard. If you were the one who could do more, throw farther, or run faster, it was different. If you were the one upon whom puberty descended first and changed your body from a boy’s to a man’s or a girl’s to a woman’s while the rest of us suffered the indignity of being stuck in a child’s body, you may not understand. But many of us learned as children that OUR best was not good enough. We learned that there was always some goal just beyond our reach, that someone else had accomplished already, which we could reach if we REALLY did our best. And when our best fell short, as it most often did, we were consoled by the cruelest of comments. “Well, at least you tried.” We were Penguins even then. Most of us have grown up now. Well, we have at least gotten older. Many of us have gone on to be successful in our careers, in our families, and in our lives. But when it comes to physical activity–say running, for example–the memories of our best not being good enough still haunt us. 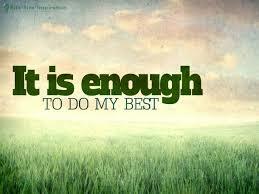 What has changed, or what can change, is that we can now say to ourselves that our best IS good enough. Our best. OUR BEST, not the world’s best, or the group’s best, or the family’s best, but OUR best is good enough. I can remember vividly the joy of finishing a 10K in under an hour for the first time. It was, on that day, absolutely my best. I needed to make no apologies, no comparisons. I crossed the finish line secure in the knowledge that I had done MY best. I remember seeing the clock at the Columbus Marathon. 4:57:58!! I had done it. I had run, waddled, stumbled, shuffled, and walked a marathon in under 5 hours. That moment will be MY moment forever. MY best. Coca Cola wanted to “teach the world to sing.” I would like to teach the world to run. But I want to teach them to run for the right reasons. I want them to know that there can still be a place in our lives every day where we can know that we’ve done our best. I want them to know the joy that comes from being absolutely sure that you have done your best. Mostly, I want them to understand that the best part is that no one can take that feeling away from you. The miracle of running, from a Penguin’s point of view, is that the lessons we learn about ourselves can carry over into our real life. Just as I have come to understand the running eagles and sparrows, I have come to see eagles and sparrows in other parts of my life. I’ve seen the ones for whom life seems easy. I’ve seen the ones who want so much from themselves that they are chronically emotionally overtrained. Then, I have come to see and understand the Penguins and myself. I understand that I have no more to offer than my best. It will be better than some, not as good as others. I’ve come to stop comparing my ability to run, to think, to love, with the people around me. And I’ve come to understand that my life, like my marathon, is for me to get through anyway that I can.